I guess most of you have already known about it, Hanabi is the Japanese word for fireworks. Hundreds of fireworks festival (hanabi taikai) are held every year across the country, mainly from the end of July to the middle of August. 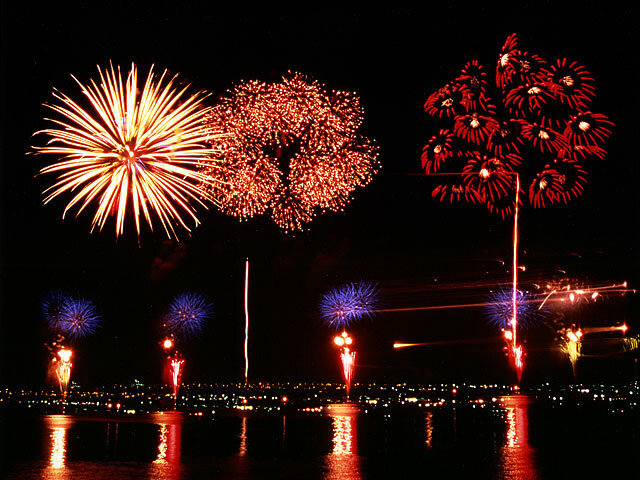 The festival itself consist of large fireworks shows that last for one to two hours. Many of the longer shows are divided into multiple shorter parts, usually there’s someone who announce the title or the sponsors in between them. The hanabi often ends with a big closing, when the hundreds shells are launched simultaneously. Since hanabi is held in the summer holiday, it’s always filled with plenty of people. It can even reach 800.000 people for a big one. On the 4th of last August when I was in Japan, I had a chance to watch one of the biggest hanabi festival in Tokyo at Edogawa river. The show started at 7pm, but some time ago before that time, there have been lots of people filled that area, both from the Tokyo side or from the Chiba side. Most of them were siting picnic-like with their family or friends and brought foods and drinks to have it while watching the show. Fortunately, I was able to find a place to sit down and watch the hanabi, though I could only manage to sit on the bushes from the Chiba side, to the end of the show and it was worthy! The hanabi show was played with the usage of songs, so you can get and understand more about the feeling of the hanabi that’s going on there and I can tell that the shells that were used were the big ones! I could feel the sound of the blast through my whole body! There’s only one word that fit enough to describe the hanabi show, which is fabulous! The other attractions to the festival are lots of street vendors selling various drinks and foods. Those vendors can be located near the location of the hanabi or on the way to the location. The foods that are sold in the street vendor varies from Japanese foods like yakisoba, okonomiyaki, and kakigori to the other countries food (I saw some people use their car sell kebab). Also, don’t forget that you can also find lots of beautiful girls and cool boys dressed in yukata. There are still lots of other big hanabi festivals in Tokyo, one of them are the hanabi festival at Sumida-gawa (Sumida River). Since I arrived in Japan on the second of August, I missed the Sumida-gawa hanabi festival that was held on the last Saturday on July. The festival was located along the Sumida-gawa in Asakusa. The beautiful fireworks were launched from the barges anchored along the Sumida River. 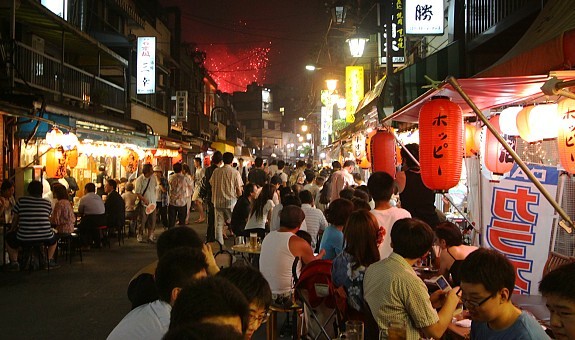 Since Sumida-gawa is located in the Asakusa area, which is in the north side of Tokyo, the neighbourhood are filled with the restaurants that were opened through the festival and provide outdoor seating where you can have some foods and drinks while watching the beauty of the hanabi. Moreover, the crowded has been started from around the Senso-ji temple and there were lots of street vendors and game stall through the street to the Sumida-gawa. If you have any plan to go to Tokyo or Japan in the next year, I think it is good to go in the summer season. Though maybe you will be disturbed by the heat, I say it is still worthy since you can watch the hanabi festivals. When you have decided to go watching the hanabi festival then make sure you prepare well enough since it will be very crowded, especially in the big hanabi festivals. Going 2 or 3 hours before the event is one of the step to avoid the crowded and get the spot to enjoy the best view. Also, make sure you don’t come alone or you’ll be very lonely watching the other people with their lover, family, or friends. Finally, for one more time, I’d say that hanabi festivals in Japan is fabulous! 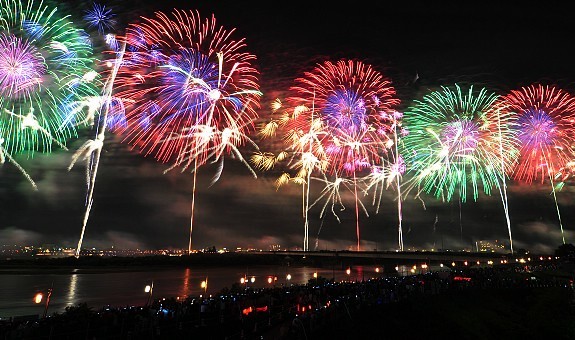 is there a good, close-to-firework, and quite place where we can enjoy hanabi at summer? somewhere romantic would be nice. were you alone watching the hanabi?